Hey everyone! Welcome to my blog! Today I get to link up with some awesome kindergarten teachers and share a little bit about myself. Thank you so much to the ladies over at Kinder Tribe for creating a blogging family for kindergarten teachers. I can't wait to see what amazing ideas start getting shared and used between all of us! 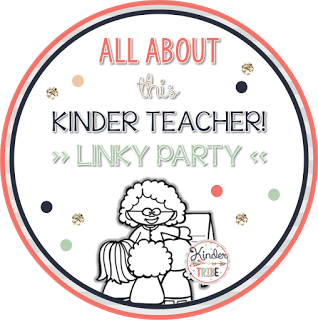 If you're a kinder teacher, stop by their blog, link up, and see how many new friends you can make! It feels fitting as I'm getting ready for the start of another school year that I share "All About Me!" since that's what I'm currently working on for my new batch of kids! So, here ya go! I CAN'T live without food. I mean, duh, none of us can, but I mean, I am obsessed with it. My boyfriend is one of those people who "forget to eat." Umm, what?? Nope that will never happen to me. I eat every few hours not because I'm on some kind of structured diet, but because I just love food! 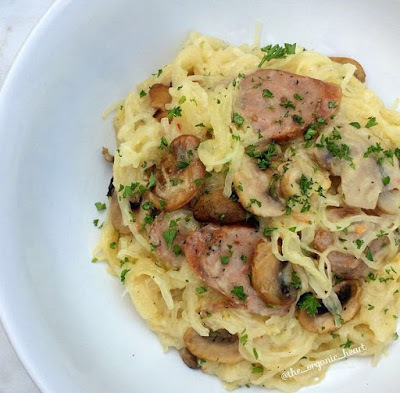 I just got done cooking some delicious spaghetti squash with chicken sausage, zucchini, and homemade lemon cream sauce via The Organic Heart. LOVE TO COOK! New box of crayons. I mean, is there a better smell? Feeling? NOPE. Well maybe the entire art center in my classroom. I love the smell of everything in that area of my classroom. Especially tempera paint! It was impossible to pick just one book, but I looooove using different voices in Chrysanthemum. Also love every single Mo Willems and Eric Carle book! 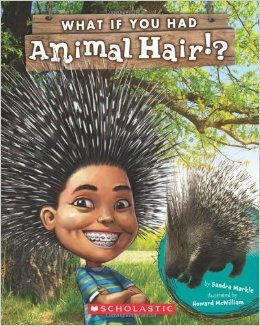 My other favorites are all of the What Would You Do if You Had Animal Hair/Teeth/Feet? books, the Miss Bindergarten books, and so many more!! 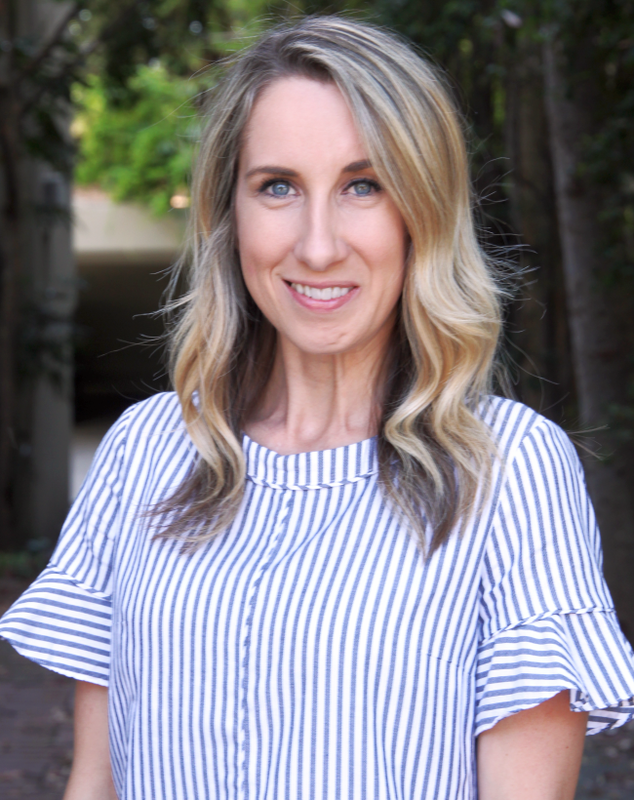 Okay so if you're looking for an inspirational, motivational, uplifting, amazing kinder blog to follow, PLEASE go follow Elizabeth Hall at Kickin' It In Kindergarten. I can't explain how much I use her products and ideas. Ok, I use them every day actually. Her BUILD centers, themed units, all so good! Just go there now and be amazed. Hey, thanks for reading!! 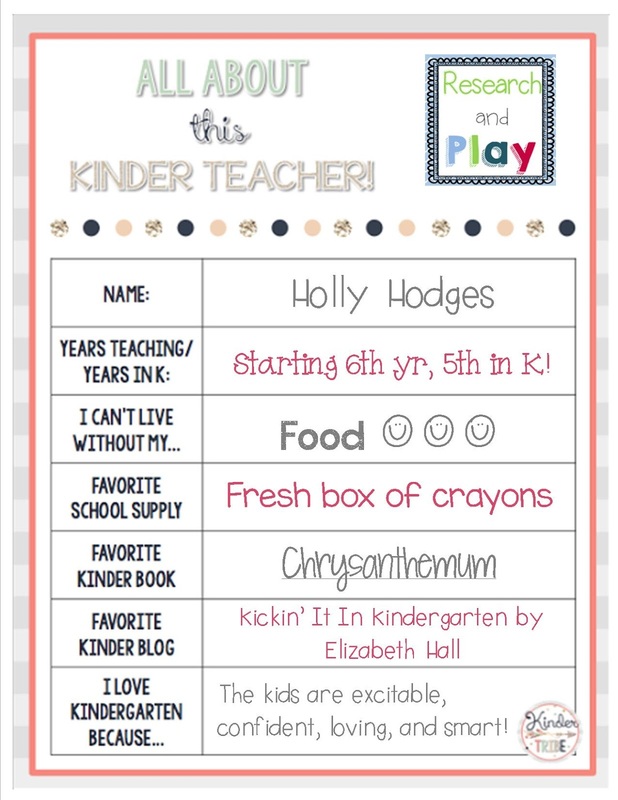 I can't wait to go back and read allll the links from other kinder teachers family! Hi Holly! So excited to meet you & be part of our new "kinder family"! I'm really looking forward to sharing & collaborating with you and our "tribe"! I love your blog! LOL! I had to laugh about your 'food'...me too...and a little too much! ;-) So happy to 'meet' you and I look forward to reading your posts this school year! Haha what can I say, my life basically revolves around eating! Hopefully I will actually write some posts for you to read, HA! I just bought quite a few new boxes of crayons and had to open them to smell them while I was unpacking!! Is that normal?? And I LOVE KICKIN IT WITH KINDERGARTEN!!! (maybe a little too much) Thanks for linking up with us! Love our tribe!!! It's not a new school year until your room smells like new crayons!! I just love the smell and feel of a fresh box of crayons. Chrysantemum is a classic in which I read to my students each year. Excited to meet you and to be a part of this Kinder Tribe.